This year, 2016, marks the 100th year of the Pulitzer Prize. For the first thirty-one years only novels were eligible for the fiction prize. Then the category was expanded to include short story collections. Eleven times, the prize was not awarded. Of the eighty-nine given, Southern writers, depending on how you feel about Texas and Florida, have taken the prize at least twenty-three times. Many of these names are perfectly familiar. Recently the prize was taken by Marilynne Robinson, Robert Olen Butler, Alice Walker, Cormac McCarthy, Richard Ford. A generation back included William Faulkner, Eudora Welty, William Styron, Margaret Mitchell, Ellen Glasgow, Robert Penn Warren, Peter Taylor, James Agee, Katherine Ann Porter, and others. Some winners did not become household names. In 1934 Caroline Miller of Georgia won with Lamb in His Bosom. It is astonishing to me that even a Pulitzer Prize winner can be utterly forgotten. The fiction prize has gone to an Alabamian three times. Most famously, the 1961 Pulitzer was awarded to Harper Lee. The other two winners are T.S. Stribling for The Store in 1935 and Shirley Ann Grau for The Keepers of the House in 1965. I am very glad I did. The Keepers of the House, which recently passed the fifty-year mark, is brilliant, powerful, stunning. The committee should have given Grau two Pulitzers. Grau, raised mostly in Montgomery, set Keepers perhaps fifty miles outside the state capital, although the state is not named and the little town outside Montgomery becomes Madison City. The story is told by Abigail Howland. Abigail is on the porch of the Howland place remembering recent events from the 1950s and some from her childhood in the ’30s. The past is powerfully present in Southern culture, and although most of the characters are dead, they are not exactly gone either; there are ghosts in this house. The family narrative begins when her grandfather’s grandfather settled some land given for his service with Andrew Jackson in the War of 1812. That Howland worked, farmed, hunted, and, over time, in spite of the Civil War, extended his holdings and prospered. The house itself was added to, wings and galleries, as needed. There would eventually be twenty-two bedrooms. Two generations later Abigail’s grandfather William married in Atlanta and brought his wife home. That wife, Lorena, died, leaving a daughter, Abigail’s mother. William hires Margaret as a housekeeper, but soon these two powerful spirits join. Their relationship is, as one would expect, the subject of gossip, but when, much later, the true, deep nature of their relationship becomes known, it sets in motion a tragedy of classical proportions. William and Margaret have children, two girls and a boy, Robert, Nina and Christine—fair-skinned, red-haired children. While still little, they attend the school for colored children. As they grow older, the children are sent north, to Vermont and Ohio, to boarding school, never to return. Margaret endures the loss, determined that her children would have room to grow, to live full lives. Abigail, armed with a new blue-and-white Ford convertible and a mink stole, goes to the state university, where she is a typical coed. She seems utterly conventional, marrying a lawyer who runs for governor on a segregationist platform—to him “it’s part of the game”—but she shows herself to be made of the same steel as her grandfather. When the crisis and the violence arrive, as we know it will, and the outraged townspeople come to the Howland place like medieval peasants with their torches and pitchforks, she will face them down, shotgun in hand, fight them, prevail, and have her extraordinary revenge. 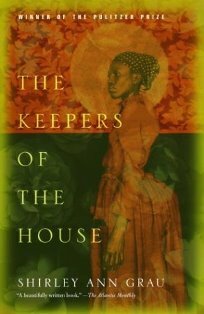 Beautifully written, The Keepers of the House is culturally insightful, and the characters are alive, mature adults. Although it is as “literary” as King Lear, it is a true page-turner. Keepers is not required reading in middle schools and will never be mistaken by anyone for children’s literature. Keepers is for grown-ups.